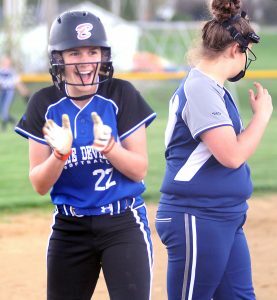 BERLIN CENTER — Tori Long had a three-run homer and four RBIs while striking out 13 in a complete-game shutout, 6-0, over Western Reserve on Thursday. Maci Linhart added two singles for the Clippers, who improve to 5-5. Columbiana will play at Beaver Local at 5 p.m. today. C–Tori Long (7IP, 13K, 2BB) and Audrey Smith. WR–Joanie Dagnan, lp (3IP, 7H, 1K, 1BB), Layla Woolf (4IP, 1H, 8K) and Morgan Donithon. GIRARD — Brooke Sauerwein drove in three runs with two triples in leading South Range past Girard, 7-3, Thursday. Julie Centofanti contributed two singles and winning pitcher Bree Kohler added a double. South Range (9-3) will host Youngstown Mooney at 5 p.m. today. SR–Bree Kohler, wp (7IP, 7K, 0BB) and Jillian Strecansky. G–Samantha Dohy, lp (7IP, 5K, 1BB0 and Hannah Jones. UNITY — East Palestine’s two seniors Taylor Hostetter and Delaney Early came through in the clutch for the Bulldogs Thursday. Both had two-run singles in the bottom of the sixth inning to lead East Palestine’s rally past Springfield for a 6-4 win at Next Level Sports Complex. Hostetter’s hit to tie the game came with one out and Early’s game-winning hit with two outs. Kenzee Johnston collected three hits and Hostetter two. For Springfield, Molly Pontinus hit an RBI double and Abby Joseph an RBI single. East Palestine (5-4) will host United at 5 p.m. today. EP–Caitlin Mohney (4 1/3IP, 7H, 6K, 3BB), Jade McBride, wp (2 2/3IP, 1H, 2K) and Taylor Hostetter. S–Abby Joseph, lp (6IP, 8H, 8K, 1HBP) and Mya Duskey. ALLIANCE — Elly Exline, Taylor Thorpe and Rylie Troy had three hits each but it wasn’t enough as Marlington beat Salem 9-8 on Thursday. Taylor Thorpe took the loss by striking out 10. Sarah Chunko hit a home run for the Dukes. Angela Cirone added three hits.